Pumpkins are in season here, but I admit I did not buy a fresh, local one for this recipe. When it comes to convenience it is unfortunately hard to beat a can of organic pumpkin puree. That doesn’t mean pumpkin season can’t put us in the mood for this super-easy recipe though! My 5-year-old has asked me about 20 times over the last week to make some pumpkin bread so this one is for her…enjoy! In a large mixing bowl whisk together the dry ingredients (from the flour down to the salt). Make a well (hole) in the center and throw in the eggs, oil, honey, and vanilla. Stir together thoroughly with a fork, but do not overmix. Fold in the pumpkin puree and nuts (if using). Generously coat a large loaf pan with cooking spray and then pour in the batter. Bake for approximately 30 – 40 minutes or until a toothpick inserted comes out clean. I just made some yesterday! I also used honey and coconut oil instead of vegetable oil. Yummy! I never think to use coconut oil…thanks for the tip! 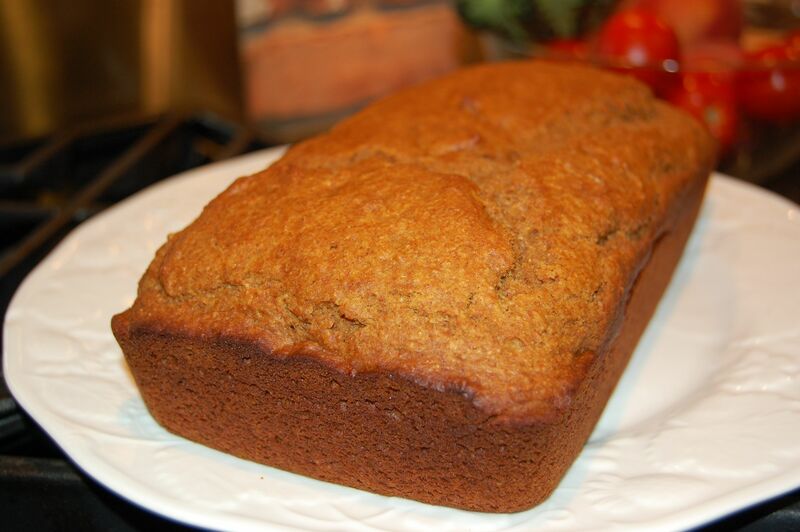 I made my own batch of pumpkin bread this morning…doesn’t it smell so lovely when baking? Thank you for sharing your recipe. I like the idea of using whole wheat flour. I will have to try that with my next loaf. I’m glad I stumbled on your blog! Let me know how it turns out for you and thanks for the comment! We actually grew some pumpkins in our garden this year and I have been looking for recipes to use the puree. To make the puree, I simply cut the pumpkin in half, scooped out the innards. Drizzled a bit of oil (you could use butter to) onto the cut side. Turned the pumpkin upside down on a rimmed (important because it gets a bit juicy) pan and cooked at 350 for ~1hour. It was then simple enough to just scoop out of the shell into the blender and puree. I have used it to make pumpkin pancakes (YUM!!) and baby food for my little one. I also froze the rest for use later in the winter. I got about 4-5 cups of puree from that pumpkin (it would have made a small size jack-o-lantern). I can’t wait to try the bread. Thanks so much for your posting. I thoroughly enjoy reading your blog! A formidable share, I simply given this onto a colleague who was doing a bit of evaluation on this. And he in truth purchased me breakfast as a result of I discovered it for him.. smile. So let me reword that: Thnx for the deal with! However yeah Thnkx for spending the time to debate this, I really feel strongly about it and love studying extra on this topic. If attainable, as you grow to be experience, would you thoughts updating your weblog with extra particulars? It’s extremely useful for me. Massive thumb up for this weblog publish!